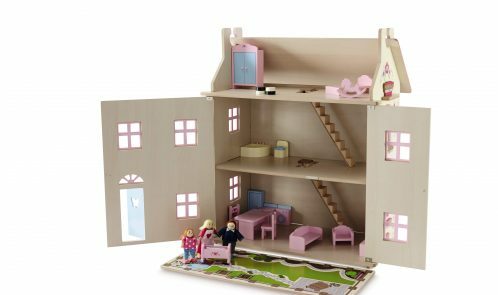 From classic dolls houses and train sets to rocking unicorns and smoothie makers, Aldi’s new nostalgic collection of great-value wooden toys – set to hit stores and online from the 26th October – has everything parents need to inspire their children to step away from the electronics this Christmas! The quality FSC certified wooden toy line up includes both classic and modern options, and is sure to leave grown-ups reminiscing and keep kids entertained for hours. 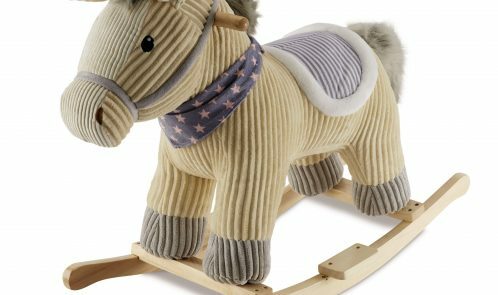 Along with this classic new Wooden Rocking Horse (£27.99), Aldi has also tapped into the unicorn craze by introducing this trendy Wooden Rocking Unicorn (£27.99); a modern twist on the original, it’s perfect for parents looking for something a little different. 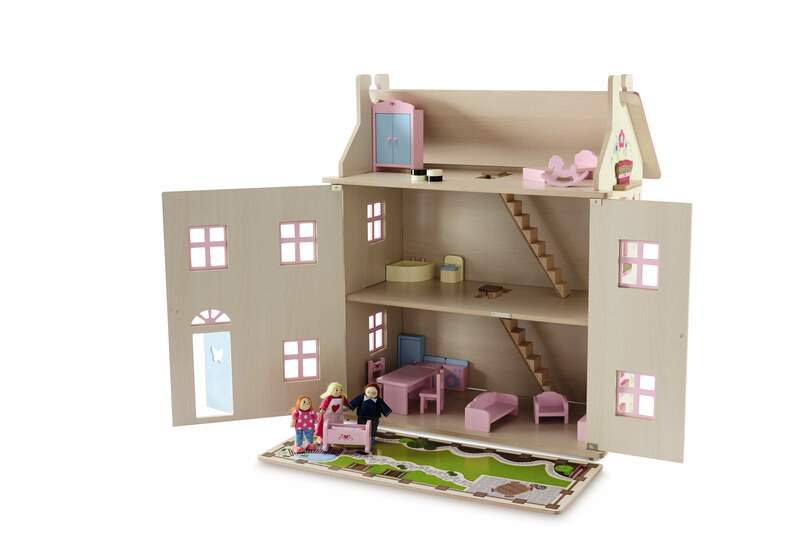 This beautiful Wooden Doll’s House (£29.99) makes for a truly magical gift. It comes with three floors, a lift-up roof and is purposefully designed to allow for simple assembly. Fill with the Wooden Doll’s House Furniture (£12.99) – a 21-piece set including everything from an oven and fridge to a wardrobe and sofa – so little ones will have everything they require to start playing house this Christmas. 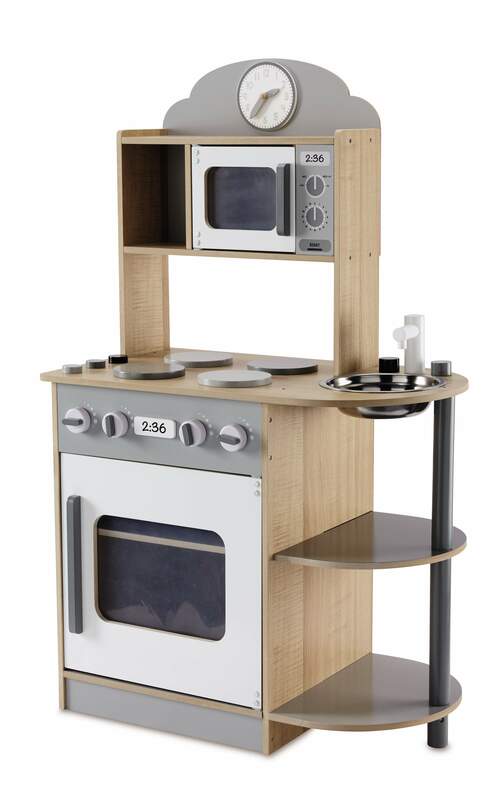 Aldi’s on-trend Large Wooden Kitchen (£29.99) is just the thing for budding chefs. It’s available in grey or pink, is made from solid wood and comes complete with an oven, hob, sink, shelving unit and even an educational chalk panel. Why not go all out and team with Aldi’s modern Kitchen Sets and Accessories (from £9.99 – £12.99) – there’s everything from a wooden toaster and food set to a coffee and smoothie maker to choose from. Back by popular demand, Aldi’s modern Wooden Railway (£14.99) and Road Sets (£14.99) both come complete with an expertly crafted array of wooden vehicles and are fantastic timeless toys for little ones to open under the tree. The shop is selling a modern Wooden Work Bench and Tools (£34.99) which is a great new addition to the range for children who are keen to try their hand at DIY. Or, the ageless Wooden Pram, Cot and Highchair (£14.99) are just the thing for children wanting to mimic their parents. The Wooden Playshop/Theatre (£34.99) offers two great role plays in one. On one side, the play shop features two shelves with storage trays to show off produce, including a starter set of three fruits and three vegetables. Wannabe grocers can even use the mini blackboard to showcase their prices and promotions. Twist around and the theatre side features a red stage curtain and a large blackboard, perfect for listing their plays and performances. For those looking for an extra special gift, Aldi are offering the high-quality Premium Wooden Kitchen (£79.99) and Premium Kitchen Accessories (£9.99) – available online only. Little ones can cook up imaginary feasts with the help of this beautiful toy kitchen unit, complete with an oven, hob, washing machine, storage cupboards and more, all in a decorative blue and green colour palette which both parents and children will enjoy. Aldi’s October Toy Event is available in stores and online at Aldi.co.uk on the 26th October, but shoppers best be quick, as with all Specialbuys, once they’re gone, they’re gone!